“in 1871, the traders were chiefly in the employ of the German firm of Godeffroy & Son, which at this date was all-powerful in the Pacific. Starting in Cochin-China: Under the direction of Johan Caesar Godeffroy in Hamburg, gradually spread ..to centres of operation at Apia and Valparaiso, and a fleet of trading barques, brigs and schooners, which combed the islands from China to the Pacific coast. Unscrupulous competition: By their steady pressure and unscrupulous competition the well-known Tahiti house of Braqnder & Hort was squeezed out of existence, and even Captain Towns found them poaching on what he considered were his preserve….’… ‘The firm is Gulliver among the Lilliputs.’ They were not popular in the South Seas – their methods were too thorough, too inhuman, too cold-blooded and mercenary. Gun runners: In Apia they stimulated war by supplying arms and ammunition from their own arsenal at Liege, secure in the knowledge that no one, native or foreign, was powerful enough to stop them. Guns for land and slaves: “For these war materials they took in payment something like 25,000 acres of the finest alluvial soil, on which they started their plantations of cotton and other crops, to work which over 1,000 labour recruits had to be imported from Melanesia. Yap and Samoa: “ Nor were these acres of blood-stained Samoa their only agricultural lands; another plantaion of 3,000 acres was later started at Yap in the Pelew Group: in the Ellice Group, too, the island of Nukufetau was acquired on account of its fine harbour. 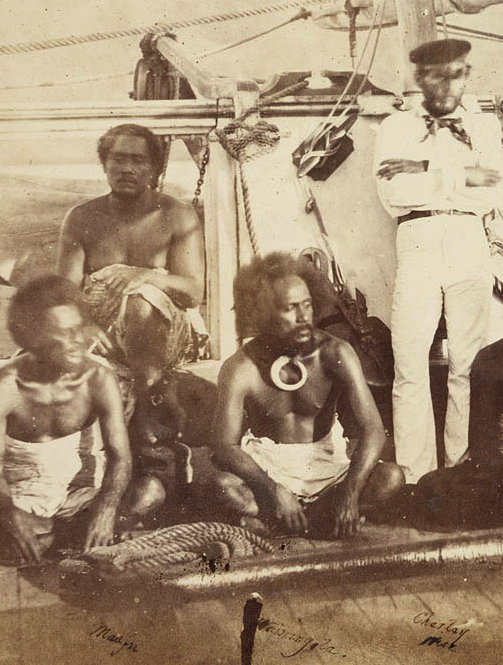 Voyage profit: “At Apia they had a shipbuilding yard and repairing sheds. They never insured their ships and they only paid their captains very low salaries, selom more than five pounds a month, but to this was added a commission of three per cent, on the net profit of each voyage. Their ships always left Apia under sealed orders, not to be opened till a certain latitude was reached; thus they were of no use as mail carriers, nor yet for passengers. Prussian style discipline: “All their business was conducted in the well-known Prussian style of discipline and with a mystery which was worthy of a European secret service. No moral considerations were ever allowed to interfere with business plans and Godeffroy’s were considered a great anti-Christian force by the missionaries. They even required their traders to take native women into their compounds without even the island pretence or marriage. Nor were any awkward questions asked as to the character and antecedents of these same traders, who received no salaries, but only trade for bartering and materials wherewith to build a house. Godeffroy’s did not worry how a trader treated the natives, so long as he managed to collect a sufficiency of copra or coconut oil, pearl-shell or sea-island cotton”. http://www.janesoceania.com/kiribati_hayes/index1.htm accessed 8 August 2008.